Have You Suffered a Traumatic Brain Injury or Spinal Cord Injury in NC? If you or a loved one think you’ve experienced a brain or spinal injury, the first thing you should do is seek medical attention. It’s important that you know what you’re dealing with, what your treatment and rehabilitation options are, and what your day to day life may look like after you’ve recovered. Whether or not another party was at fault for your injury, going into your recuperation informed and well educated on your injury will give you the best chance at a successful recovery and return to your normal life. If you believe you have suffered an injury due to someone else’s negligence, contact our law office today for a case review. A brain injury, or an injury that may result in brain damage, is an injury that causes the destruction or deterioration of brain cells. In the United States alone there are over two and a half million brain injuries annually and on average more than 50,000 of those injuries are deadly according to the Brain Injury Association of America. Acquired Brain Injury (ABI): These injuries occur at the cellular level and are generally associated with irregular pressure being placed on the brain. These injuries are caused by conditions like tumors, neurological illnesses, or a stroke. Traumatic Brain Injury (TBI): These injuries are caused by an outside force, like getting hit in the head. That force then causes your brain to move inside of your skull or it may damage your skull which may in turn damage your brain. Focal, or localized brain damage only causes damage to a section or small part of the brain. For example, a gunshot wound is generally confined to one part of the brain. A closed head injury causes damage to more than one area of the brain and is caused by trauma like a sudden, violent motion which causes the brain to knock unnaturally against the skull. Mild Brain Injury: Usually temporary and may cause confusion, nausea, headaches, and memory problems. Moderate Brain Injury: Generally temporary, and may cause confusion, nausea, headaches, and memory problems, but these symptoms can be more severe, pronounced, and last longer than those of a mild brain injury. Severe Brain Injury: May result in coma or even death, and may alter your lifestyle and incapacitate or cause debilitating problems like behavioral, physical, and cognitive disabilities. A spinal injury is an injury to the bones that make up the spine or the spinal cord, or the bunch of nerve fibers and tissue surrounded and protected by the spinal vertebrae. The spinal cord is linked to the entire body in one way or another, and communicates chemical impulses from the brain to the rest of the body through the nervous system. Spinal injuries can cause devastating physical and financial hardship. To learn more about your legal rights and options and after suffering a spinal injury in NC, contact the Raleigh personal injury lawyers Kirk, Kirk, Howell, Cutler, and Thomas, LLP today. However, the most recognized danger in a spinal injury is an injury to the spinal cord. Spinal cord injury comes about when an injury or condition blocks communication between the brain and the body. Following the injury, one’s sensory, reflex, and motor skills are impacted. The more severe the injury, the less likely those skills are to totally recover. Generally, the higher the injury occurs on the spinal cord the more severe the dysfunction. Higher injuries occur in the cervical nerves between C1 and C8. Then the mid-back section, or thoracic vertebrae and nerves between T1 and T12. Finally the lumbar nerves between L1 and L5 and the sacral nerves between S1 and S5. Injuries are classified as complete or incomplete, based on if sensation or movement occurs at or below the level of injury. Our Raleigh spinal cord injury lawyers, in conjunction with local medical experts, have the knowledge and resources to help you recover your quality of life by fighting for your future medical and financial needs. Mild brain injuries don’t generally require treatment or medication outside of rest and over-the-counter pain relievers. A mild brain injury should be monitored for worsening side effects or new symptoms to ensure a full recovery is made. Following immediate treatment, doctors may choose to operate on the injury in order to remove clotted blood, relieve pressure inside the skull, and repair skull fractures. While there is no way to reverse spinal injuries, recovery is possible with the right treatment. Immediate medical attention is imperative to reduce the effects of any trauma to the spine. Treatment for spinal cord injuries frequently begins on scene at the accident. The first step is to immobilize the spine to prevent further damage. Sedation may be administered as well in order to minimize movement. Next, doctors will work to prevent shock, keep airways open, and prevent any other complications like blood clots. With a spinal cord injury you may be admitted to the ICU or spine injury center where a team of spinal cord injury experts, psychologists, social workers, nurses, surgeons, specialists, and therapists will administer medication and perform surgery in order to give you the best chance of recovery. These medical bills can add up quickly. Don’t take on the health insurance companies yourself. Our attorneys have over 50 years of combined experience helping victims of catastrophic injuries get the compensation they deserve. A spinal injury may require ongoing care in order to prevent bowel and bladder issues, respiratory infections, blood clots, deconditioning, pressure ulcers, and muscle contractions. The length of your hospital stay will depend on the severity of your injury and you will likely stay at a rehabilitation care center before you are fully released back to your day to day life. While rehabbing, you’ll work to strengthen existing muscle function, learn adaptive techniques to accomplish day-to-day tasks, and re-develop fine motor skills. You’ll learn about the complications of your injuries, both short and long-term, and preventing other injury-related problems. You will also be taught new skills, how to use equipment and technology that can help you live as independently as you can and be encouraged to resume hobbies, social and fitness activities, and return to school or work. If you or a loved one has been incurred a brain injury that has caused damages that could lead to death or permanent disability, contacting a qualified Raleigh personal injury lawyer is in your best interests. Due to to high costs and change of lifestyle that is associated with this type of injury, an experienced legal team will determine all the factors of the case to help you recover damages. Our team will actively pursue compensation to hold the responsible party accountable. We will work on your case so that you can focus on recovery. 3rd Party accidents – Homeowners, random accidents, etc. Breach of Duty – did negligence cause harm? Damages Due – did the injury result in lost wages, hospital time, etc.? For over 50 years, our Raleigh law firm has served the community and in doing so have developed a relationship with expert witnesses such as doctors and other health practitioners. We will speak with medical experts to determine causation and the link between negligence and the clients injuries. Our medical experts can review medical records to evaluate as evidence and be called on as expert witnesses to give testimony to jurors. 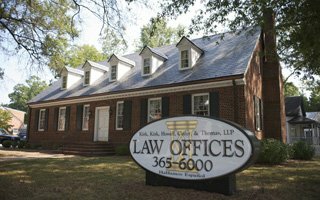 The attorneys at Kirk, Kirk, Howell, Cutler, and Thomas, LLP have over 50 years of combined legal experience in personal injury, car accident, and wrongful death cases for clients in Raleigh, Wendell, and across North Carolina. Our personal injury lawyers understand the physical, emotional and financial distress a brain or spinal injury can bring to you and your family in Raleigh, NC. Our experienced attorneys work closely with local physicians and medical experts with confidence to ensure every base in your case is covered. Call our Raleigh legal team today for a free initial consultation at (919) 615-2473, or you can reach our Wendell office at (919) 365-6000.